37 MALLET,A.M. DE LA SPHERE. Figure III. Paris 1683. Uncoloured. Some age-toning of paper. Else very good condition. 144 x 100 mm. Je voudrais de plus amples renseignements sur le Lot N°22630 . 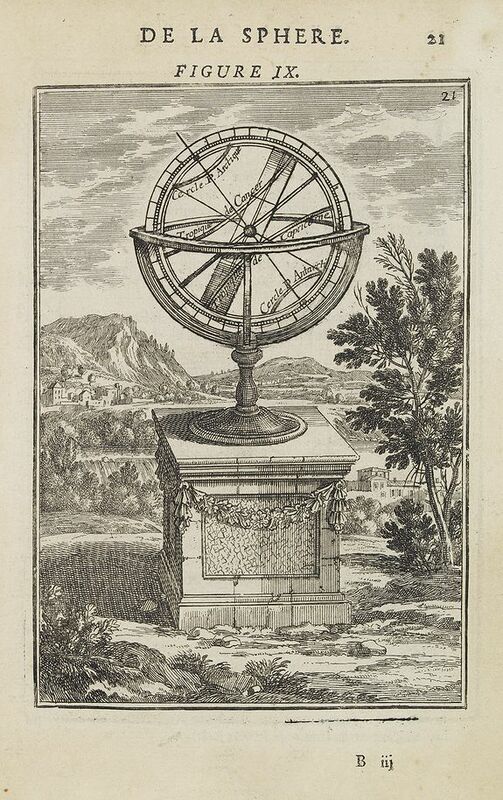 ¤ Appealing print focused on an armillary sphere. The latter is surmounted by a cartouche containing some angles in a cirle. 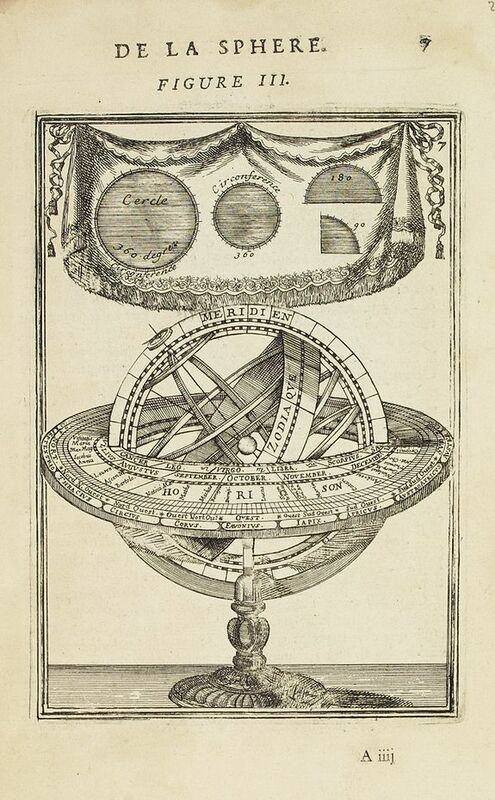 From the French text edition of Description d'Univers.. (5 volumes), 1683. By Allain Manneson Mallet (1630-1706), a well travelled military engineer and geographer who worked in 17th century France under King Louis XIV. 38 MALLET,A.M. DE LA SPHERE. Figure III. Paris 1683. Uncoloured. Some age-toning of paper. Else very good condition. 144 x 100 mm. Je voudrais de plus amples renseignements sur le Lot N°22627 . 39 MALLET,A.M. DE LA SPHERE. Figure IX. Paris 1683. Uncoloured. Some age-toning of paper. Some discolouration along the margins. Good condition. 147 x 101 mm. Je voudrais de plus amples renseignements sur le Lot N°22637 . 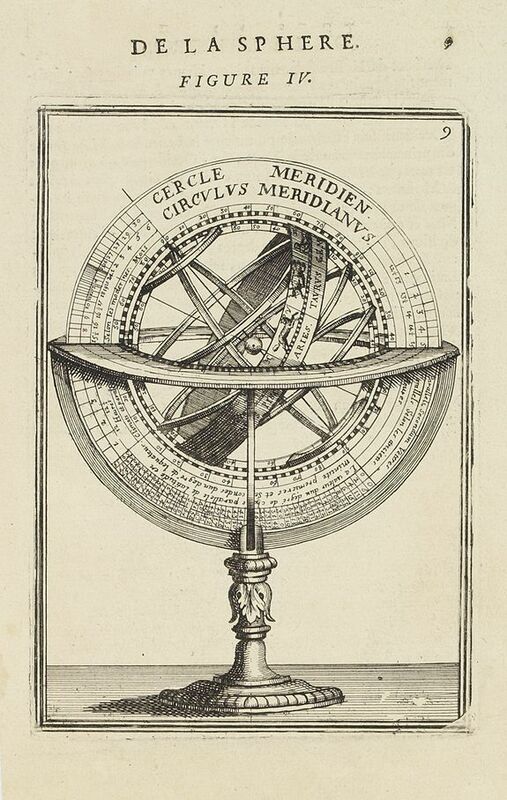 ¤ Appealing print focused on an armillary sphere. 40 MALLET,A.M. Des Colures. Paris 1683. Uncoloured. Some age-toning of paper. Stain in the lower left corner, not affecting the engraved area. Left margin cut short. Else good condition. 148 x 106 mm. Je voudrais de plus amples renseignements sur le Lot N°22634 . 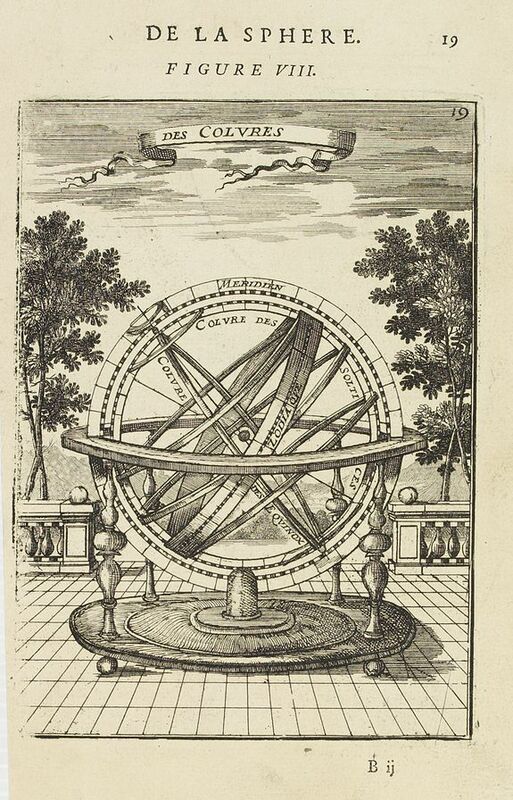 ¤ Appealing print focused on an armillary sphere showing the equinoctial and the solstitial colures. 41 Joseph van den KERKHOVE. "Allégorie de la Géographie". Bruges, 1669 - 1724. Huile sur toile. Diamètre : 88 cm.- Oil on canvas round. Diameter : 88 cm (34,60 in.). 880 x 880 mm. Je voudrais de plus amples renseignements sur le Lot N°34112 . ¤ Huile sur toile par JOSEPH VAN DEN KERKHOVE. Elève d'Erasme Quillyn le père, le peintre flamand Joseph van den Kerkhove choisit de partir voyager à l'étranger pour compléter sa formation et développer ses talents artistiques. Il se rend à Paris mais ce séjour ne lui fera pas oublier la manière de son maître. Il se plait à peindre des compositions nobles et grandioses avec des couleurs chaudes. Ses tableaux présentent d'une part des sujets mythologiques et de l'autre des sujets bibliques, ces deux thèmes se retrouvent dans les grandes compositions qu'il a réalisées à Bruges. Il a peint quinze tableaux sur la vie du Christ pour l'église des Jacobins, quatre autres sur les Œuvres de la miséricorde pour l'église collégiale de Saint-Sauveur, et une composition représentant le Conseil des Dieux sur le plafond de l'hôtel de ville d'Ostende. Passionné par son art, Joseph van den Kerkhove a crée une Académie de peinture à Bruges et en fut le premier directeur. Provenance : Collection particulière, Belgique. Oil on canvas, by JOSEPH VAN DEN KERKHOVE. Deux Putti étudient un globe terestre, l'un d'eux tient un compas. Les informations portées sur le globe sont imaginaires mais les deux cartouches et les bateaux sont typiques du 16e siècle. Van den Kerkhove s'est sans doute inspiré de ses concitoyens Gerard Mercator, Hondius et Blaeu. 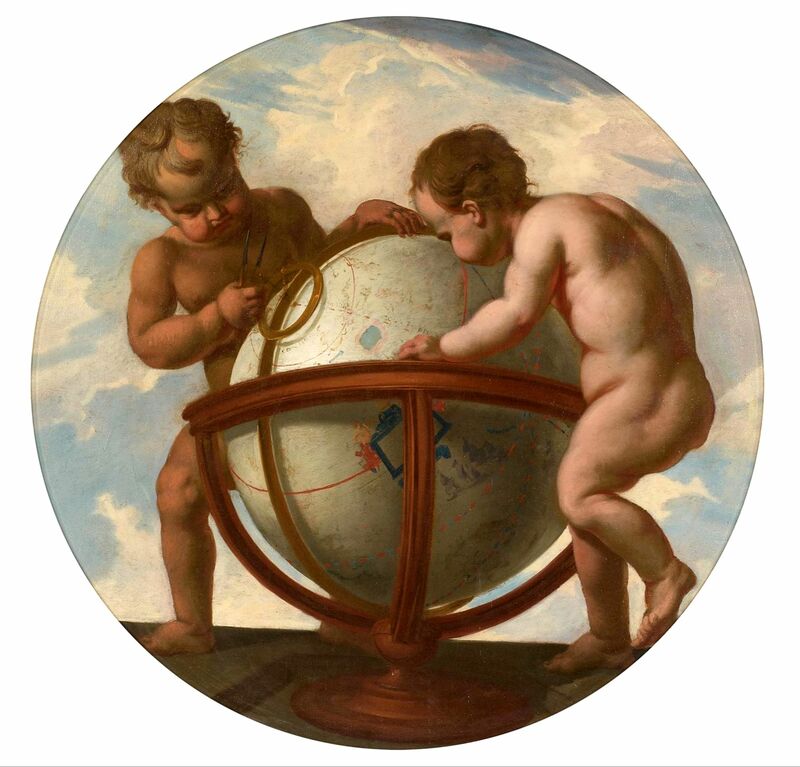 Two putty studying a terrestrial globe, one of them holding a pair of dividers. The information on the globe is clearly imaginary but the two cartouches and ships are typically 16th century in appearance. Was van den Kerkhove perhaps inspired by his countrymen Gerard Mercator, Hondius and Blaeu. Joseph Vanden Kerkhove was a Flemish historical painter who was born Bruges in 1669 and died in 1724 aged 55. He was a disciple of Erasmus Quellinus the elder in whose school he showed himself studious and diligent and his proficiency was proportionable to his work. When he began to practice his profession he went early to France where he found encouragement and in a few years returned to his own country with a good reception and always painting in the style of his master. His colours are warm and his design correct, his composition is generally in the "grand taste" and he rarely introduced anything but what seemed necessary to embellish his subject. He had thoroughly studied the principles of perspective and he was an expert in that branch of his art. The backgrounds of his pictures are usually enriched with classical architecture. On the ceiling of the town hall at Ostend he painted a very fine design representing "the Council of the Gods" in which there is an ingenious and learned disposition of the figures and it is altogether a masterly execution. - Biographical Dictionary of Painters, Sculptors, Engravers, Volume 1. 42 DESNOS,L.C. / DE MORNAS,B. Globe Terrestre. Paris, 1762. In original colours. Water stains in lower margin, just affecting printed border. Overall good condition bur some brown spotting. Dark impression. 385 x 540 mm. Je voudrais de plus amples renseignements sur le Lot N°21322 . ¤ Decorative map of the world on a globe. Left and right a box with information's about the terrestrial globe. 43 MALBY A pair of English 3-inch globes. London, 1844. In original o/l colours. Matching terrestrial and celestial globes, made from hand-colored, engraved gores, pins at poles, resting in matching turned mahogany cases with domed lids. 11 cm. high. 110 x 100 mm. Je voudrais de plus amples renseignements sur le Lot N°28503 . 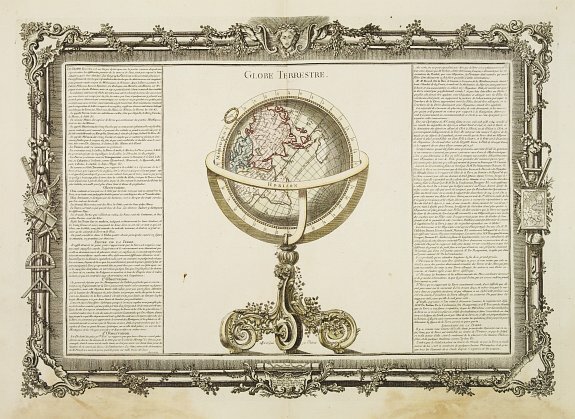 ¤ With pasted label on each globe with the complete titles on each : MALBY'S Terrestrial Globe Compiled from the GLOBES of the SOCIETY FOR THE DIFF[?]. OF USEF[??] KNOWLEDGE Houghton St London March 1st 1844. MALBY'S Celestial Globe Shewing the Principal STARS of each Constellation. HOUGHTON ST. LONDON March 1st 1844. The Malby family of map and globe makers was started by Thomas Malby, Sr. about 1839 and continued producing globes until at least 1860. The firm operated as Malby & Son with Thomas Malby, Jr. and globes produced by the company generally were engraved by C. Malby -- presumably a family member -- and later continued by Thomas Malby III. 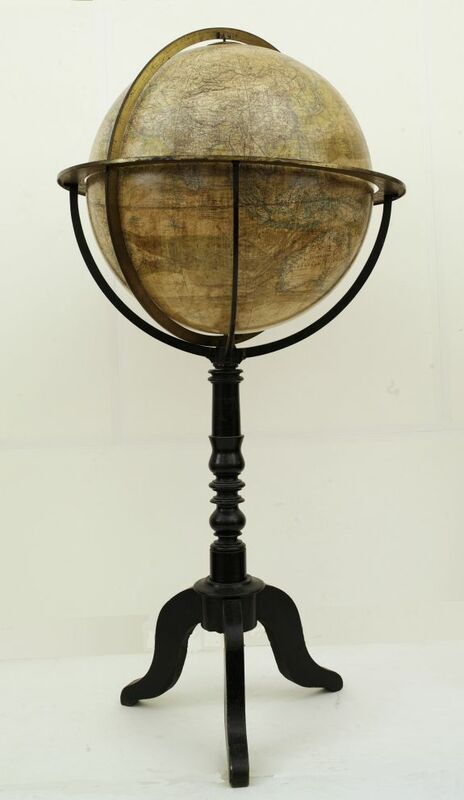 Malby produced a variety of table globes in many sizes as well as this interesting pocket globe. The depiction of the lines of magnetic variation on a globe was a Malby innovation. The Malby firm associated itself with the geographical publishing of the Society for the Diffusion of Useful Knowledge (SDUK). The terrestrial globe has several areas off missing area, and paper label, who are carefully replaced with facsimile or redrawn in brown ink. 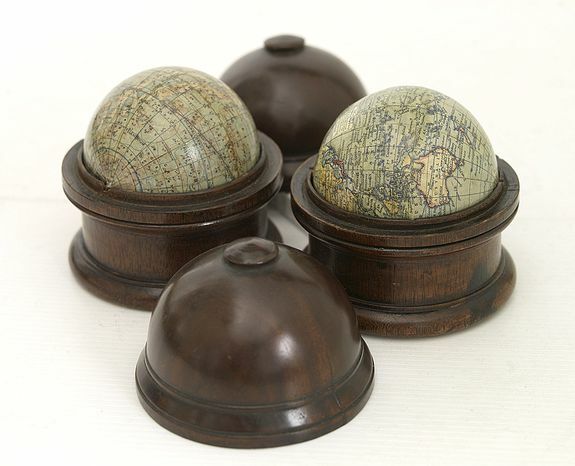 Nevertheless a rare set of globes which make a great presentation. 44 BERTAUX, Globe terrestre d'après les découvertes.. Paris, 1885. In original colours. A 19-inch (482mm) terestial globe, total height 112cm. Diameter of brass horizon 60cm. 1120 x 600 mm. Je voudrais de plus amples renseignements sur le Lot N°6374 . ¤ Atractive and large (height 112cm) library globe by a prominent Paris globe maker, with brass meridian circle, horizon ring and hour ring, supported by four brass quadrants on elegant baluster turned wooden column with three inswept legs terminating in pad feet. Twelve coloured lithographed gores and two polar calottes, showing steamship navigation routes and ocean currents, political and geographical boundries defined, telegraph cable routes, explorations until 1878/80 (by Nordensköld), Ocean currents coloured by hand. Emile Bertaux (fl.1880-1900), active in Paris, rue Serpentine 25, made globes for many Paris sellers including Dien, Dubail and the planetary globes by Eichens. Few repairs of some surface cracks, very well executed and hardly notable. The usual light scratches and abrasions. Printing of the map is very delicate, ocean currents are coloured and therefor sometimes more prominent than the continents. Condition of globe is generally very good. A attractive and impressive library globe! NOTE; Extra shipping costs apply: Please contact us for estimate.